By	Allyson Haymaker. Last edited by Marios Alexandrou. This is a ‘must see' if you visit Tucson, Arizona. The Tucson Rodeo Parade Museum and its more than 100 original and reconditioned wagons, stagecoaches and buggies, is well worth the trip. With names like Conestoga, Belly Dump and Victoria Coach, it's the largest such collection in the U.S. 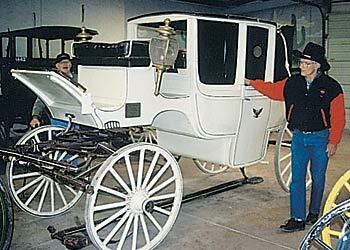 The guides are Western frontier-history aficionados who tell fascinating stories about the vehicles, like the luxurious White Brougham stagecoach used by the Dalton Gang to rob a bank just before their arrest! You might recognize some vehicles from Hollywood classics. We saw one of the fringe-top surreys that Shirley Jones rode in Oklahoma! and a wagon that was painted to match actress Maureen O'Hara's red locks.If you're in Tucson the Thursday before the last full weekend in February, enjoy the world's longest non-motorized parade, which features about 75 museum vehicles. It's quite a show, attracting more than 200,000 people. The parade kicks off the 5-day Tucson Rodeo, known as “La Fiesta de los Vaqueros”, or “The Festival of the Cowboys”. Tucson is at the junction of I-10 and I-19 in southeast Arizona. The museum (4825 South Sixth Ave.) is open from 8 a.m. to 4 p.m. Monday through Saturday from early December through February, or by appointment. For details, see www.tucsonrodeoparade.com or call 1-520-294-1280.